@Marek: Would these bring you over the 150 limit? These are really small additions so they are fine. @Mike: Congrats on the finished build! @Linus: Welcome to the campaign! That looks like a quick build. 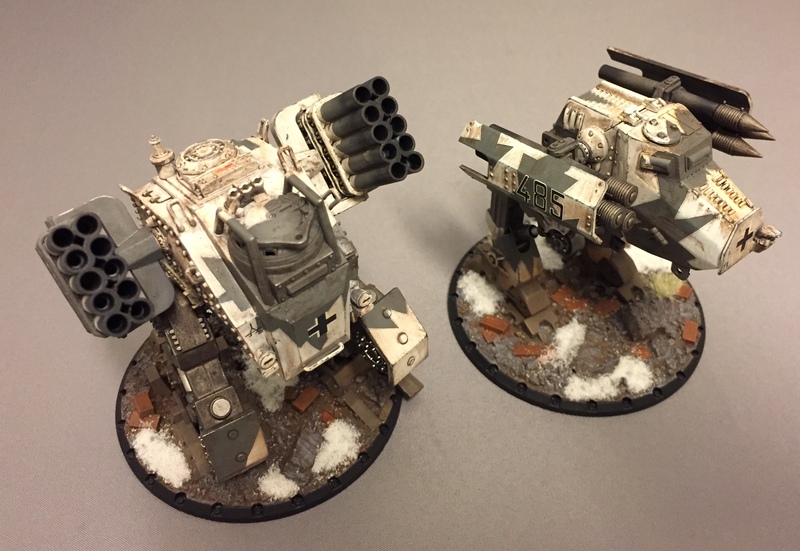 I am calling these walkers done. This is a great campaign and looking forward to follow more rest builds here. Superb job, Jesper! Great build and even better weathering! 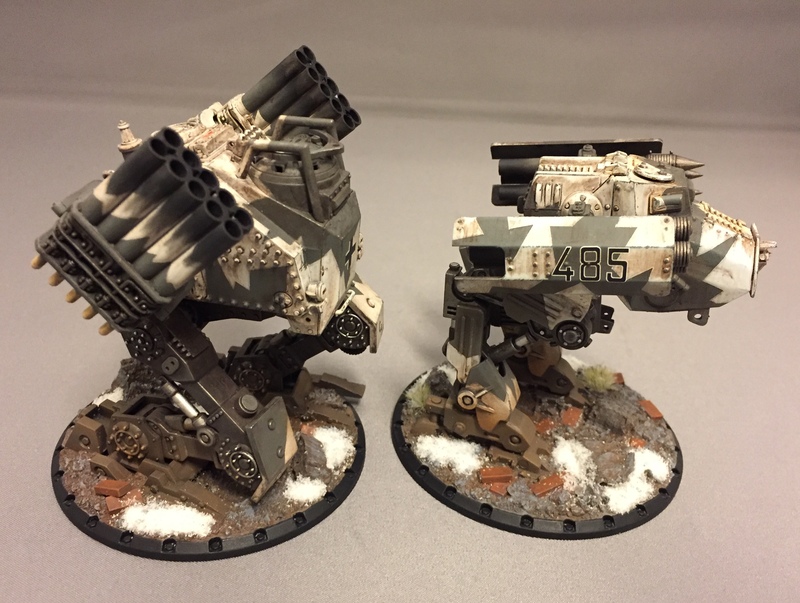 The snow patches really add to the overall effect, putting the winter camo in context. Fantastic! Congrats on the finished build! Thanks for the comments, Christian. I am also quite satisfied with the final result. Excellent as usual, Jesper, you make the imaginary look legit. Great work! My entry for the campaign. Very nice, Gary, you don't see too many of those around here! That turned out really nice, Gary! 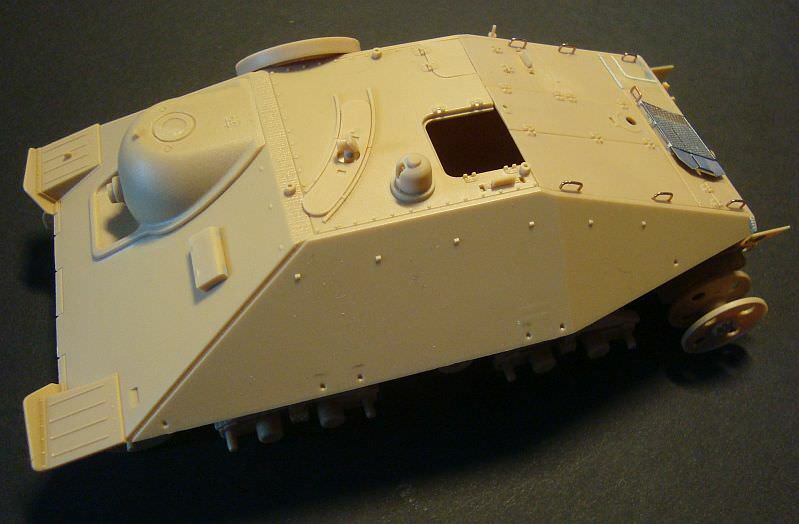 Do you happen to have an image of the un-built kit with a proof of date? 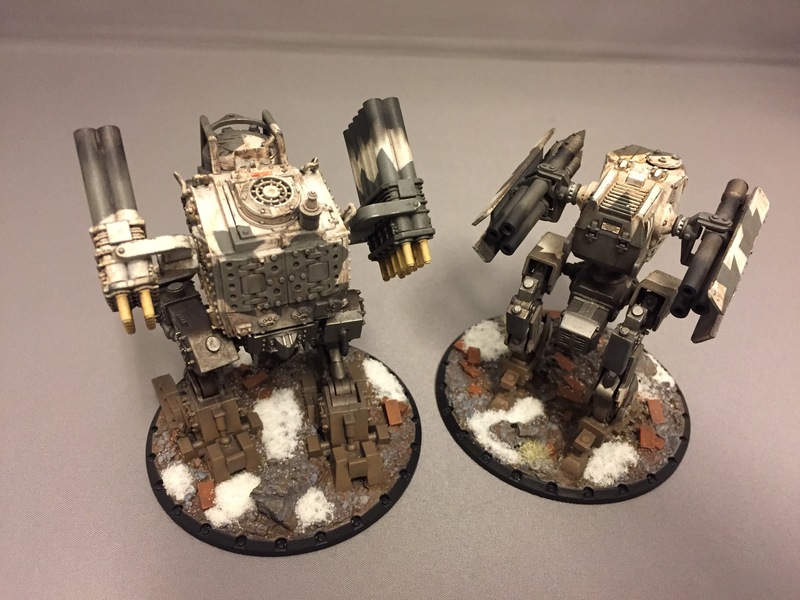 Rule #3 and #5 says that the kit needs to be unstarted when you enter it to the campaign and that you need to upload a photo of it with a proof of date. Hope you all don't mind me joining the campaign a touch late...looks like a bunch of you are already done! 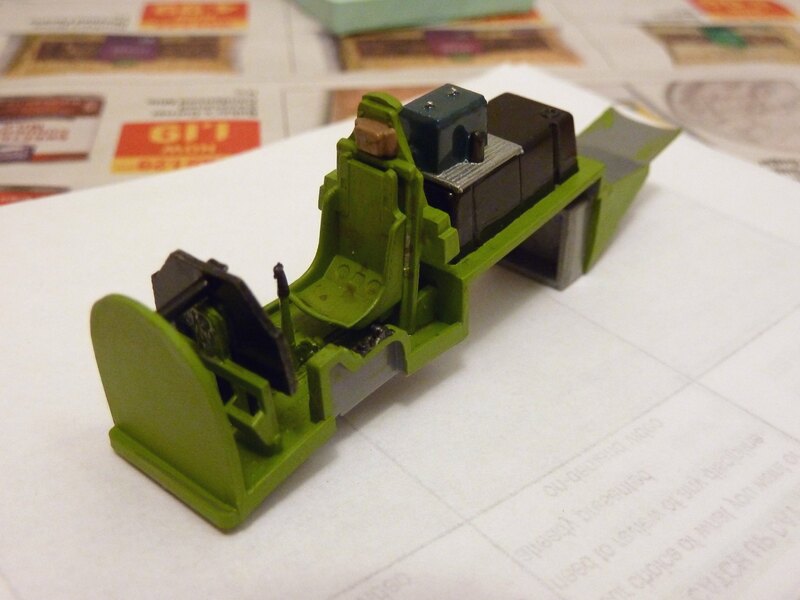 Actually, after a three-year hiatus, I'm finally returning to the hobby of turning small pieces of gray plastic into big pieces of green plastic. A short build like this should be just what I need to get my modeling chops back in order. 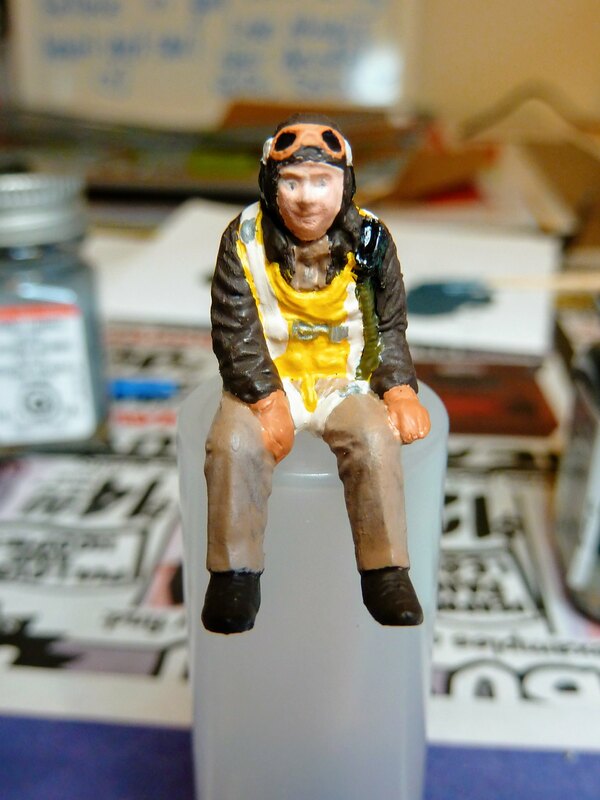 My entry will be Tamiya's 1/48 USAAF fighter pilot, total piece count is 1. 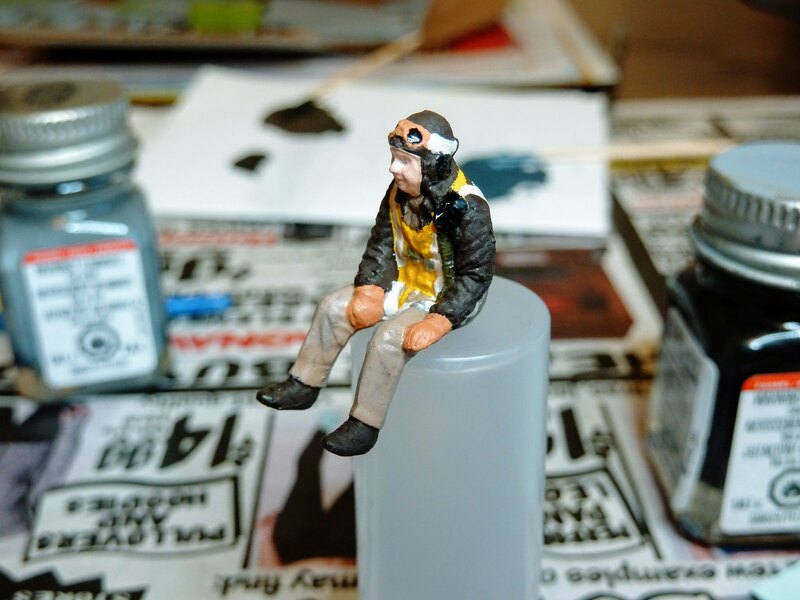 Pardon the poor quality photos...like painting skin tones, I have yet to master macro photography. 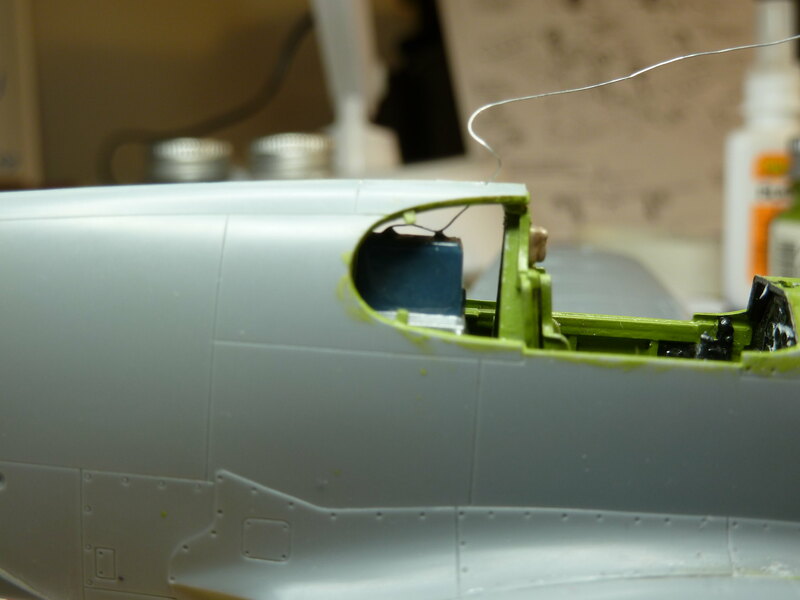 Tamiya also included with the pilot kit a P-51B, so I'll be adding that to my campaign entry as well. Total piece count is under 80. Cockpit went together nicely. 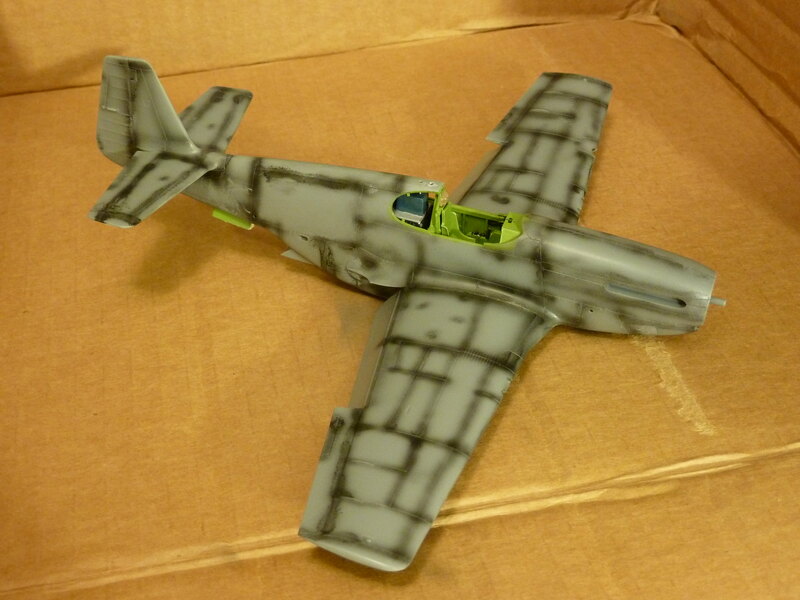 I'm aware of the discrepancies between different Mustang models, kits, and all their cockpits, but fixing this one is out my budget and skill-set. 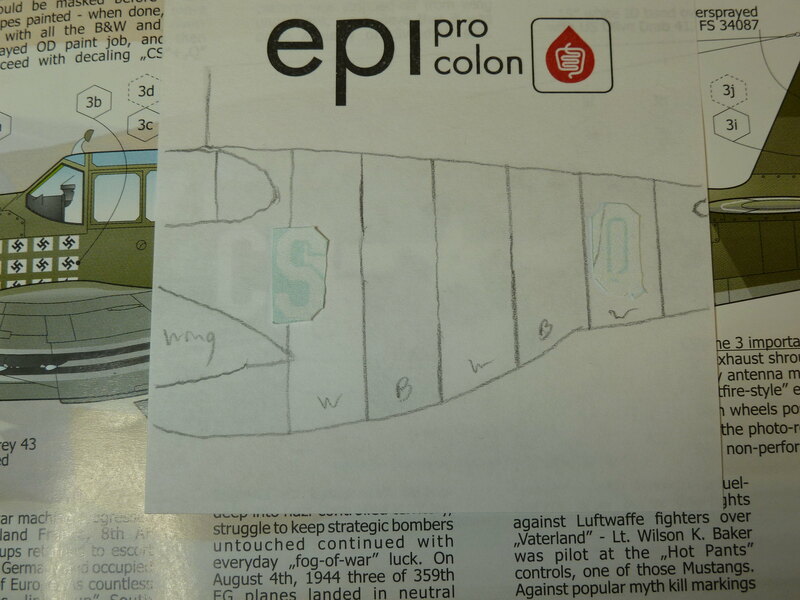 The plane should be taking shape shortly. It really feels great to be able to build again. Yep, it's like riding a wonky bicycle, Robby! You never quite forget how! Welcome back. 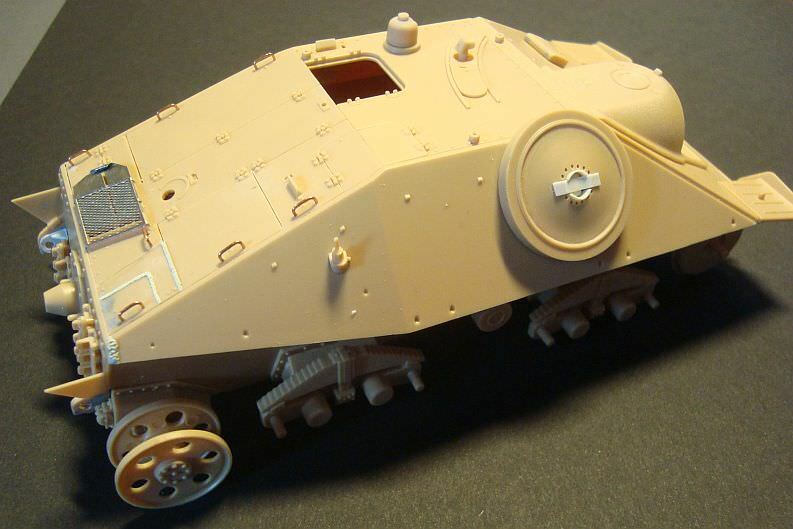 Gary, the whole point of a campaign thread is for us to show our progress on a kit as we build it. Not just a set of photos of a finished kit saying this is my build. If that were allowed then anyone of us could just stick up a photo of a finished kit and say quite dishonestly that this is my entry. BTW I just had a look at the instructions as 78 parts seemed a bit low as I was debating buying one of these and 78 parts didn't sound right. It's 127 parts as some parts like 19 is 18 wheels in total so it's something to bear in mind when campaigns are number specific with parts. 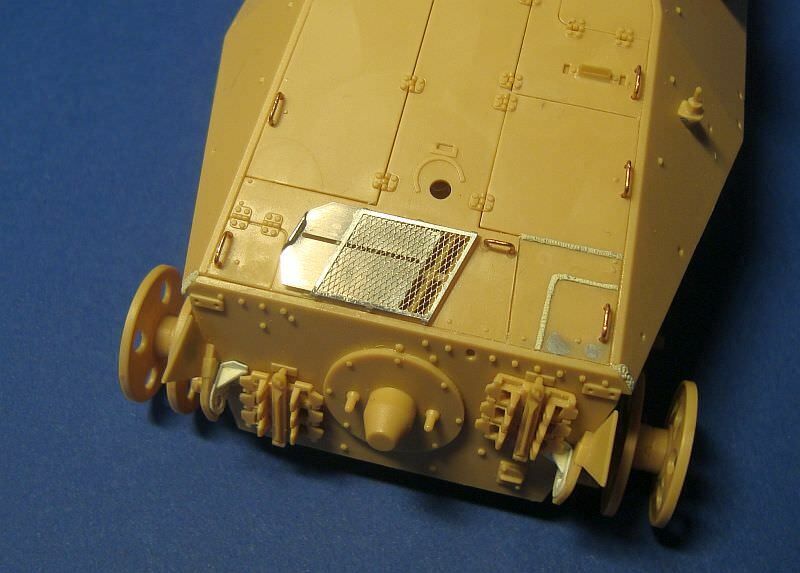 It's how many parts are used not numbers on the sprue. 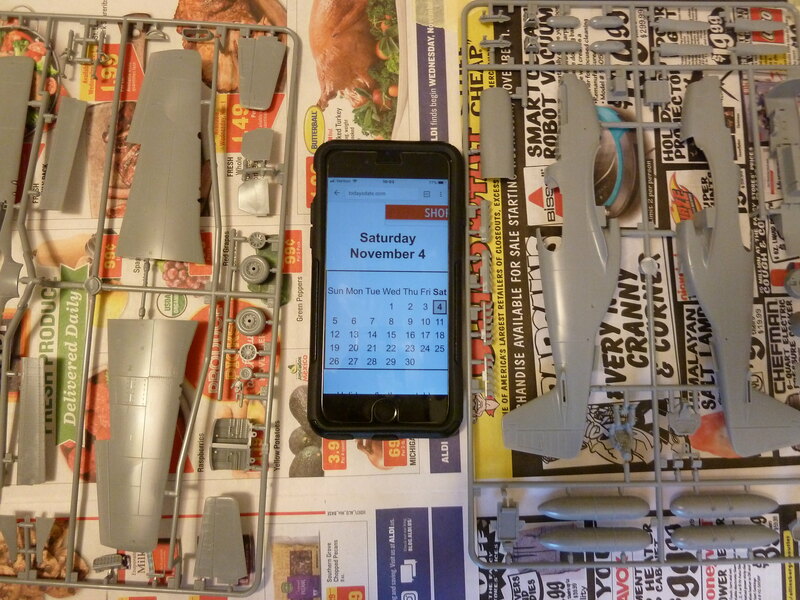 I'm three steps into the Revell (1967) M48 AVLB kit. Finally, I've got a real shot at actually comepleting a kit this year!! Richard, looks good on this venerable kit. Looking forward to see more as ypou progress. Here are some progress photos of my G-13. So, if we will count all those small parts there will be a hundred used till now. Please, let me know if I should count every single tiny part, because I'd like to know what else I could add to this model without violating the rules of this campaign. I ran into some nasty gaps in my MPC AT-ST. I've tried to fill them with auto putty and stretched spruce. 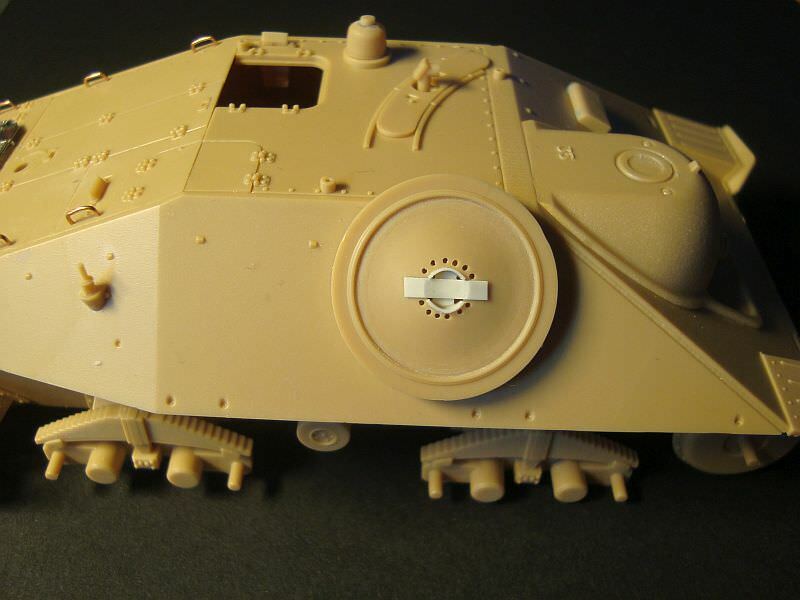 Since my model is a hypothetical Cold War Soviet machine I might try some casting texture to hide some of this mess. I'm enjoying everyone's builds, keep up the good work! Sorry for disappearing for the last week or so! I had a couple of busy days. @Robby: Welcome! Glad to have you join! @Gary: I'll have to agree with Karl, you'll need to show us more of the progress and comment on them a bit, specially on such simple projects. @Richard: Nice and clean build! @Marek: Don't be too concerned about the overall part count. Add whatever you need to make it look good. 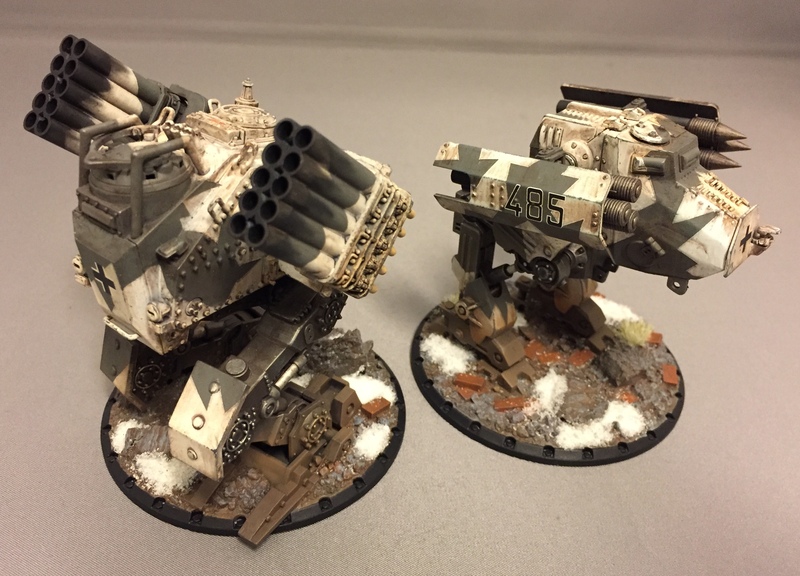 A couple more or less parts won't cost you the banner. Great job on the welding seams, by the way! @Don: Creative thinking at its best! The main body went together quick and painless. I decided to add some wiring to the radio for extra detail. 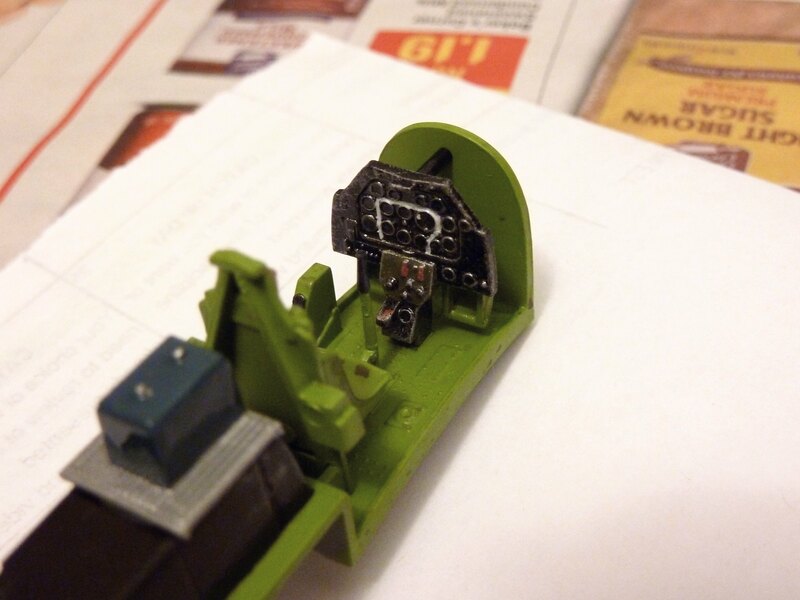 I threaded wire through the fuselage's antenna hole and CA'd it in place, then clipped it at the top of the hole. 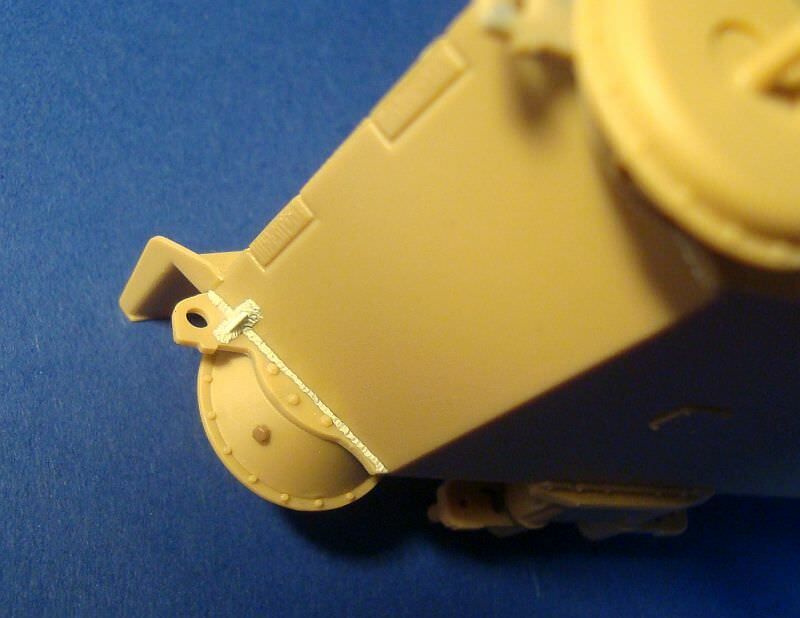 Repeat for the second wire (not pictured), a bit of CA and putty to hold the loose ends in place, and there's a cool little bit of detailing that I can now add to my repertoire. If you'll indulge me, here's my success story. 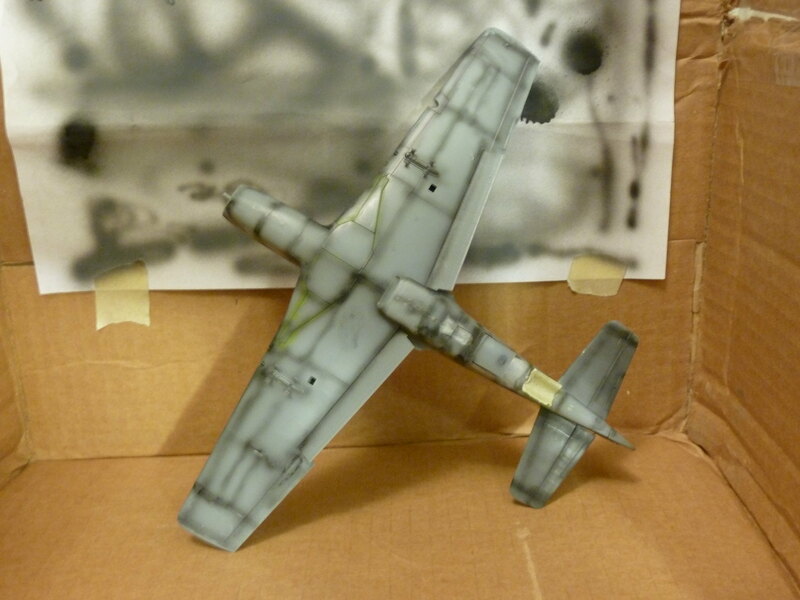 A few years ago, I had some real airbrush trouble. 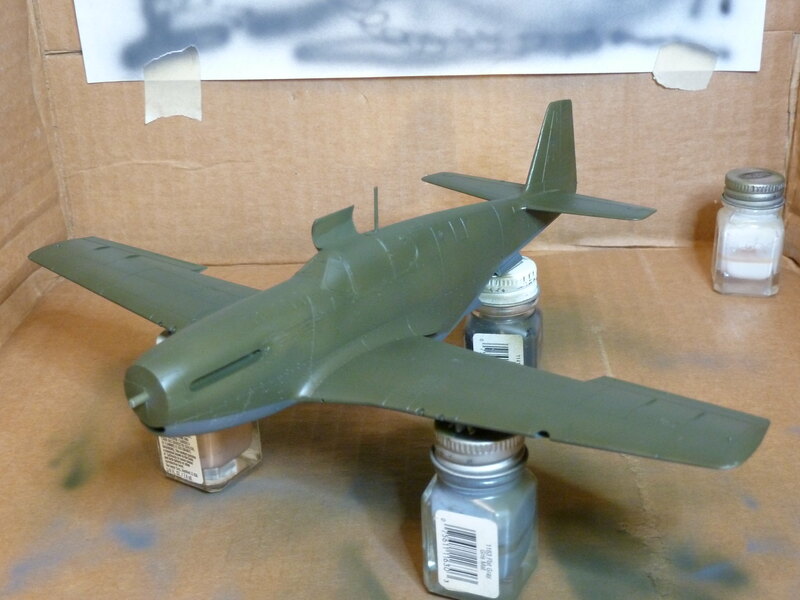 Without going into the details of my hatred towards airbrushing, it got to the point where I didn't even want to build because it meant something to paint later on. In order to face my demons, I bought a hobby air compressor (quiet enough to use in the apartment, especially compared to my old shop-sized compressor). For those interested, it's the Master Airbrush TC-20T with G22 airbrush kit, sells altogether just over $100 on Amazon. 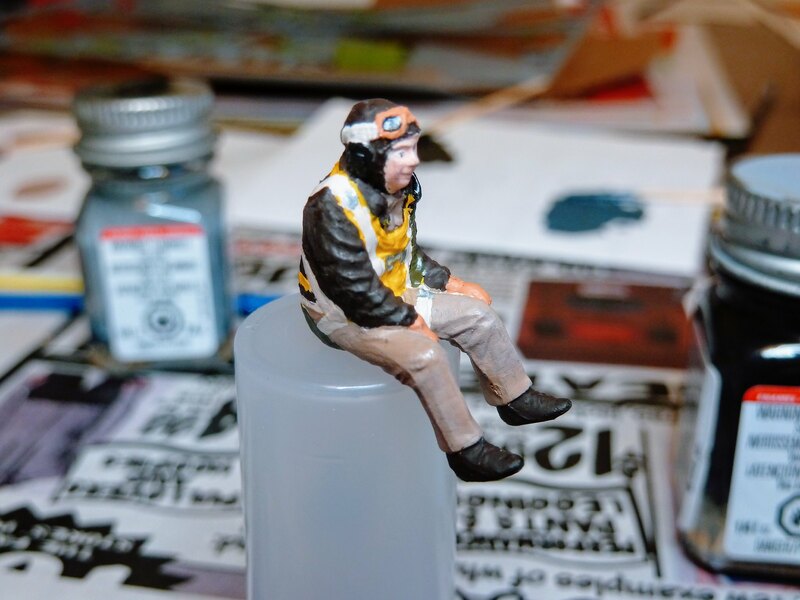 Guys...I now look forward to painting models!! Honestly I don't know what I'm doing different this time around, but now it's easy and enjoyable and looks SO much better than hand-painting the whole thing. Preshading turned out good enough for a first attempt. I'm opting for an open birdcage. 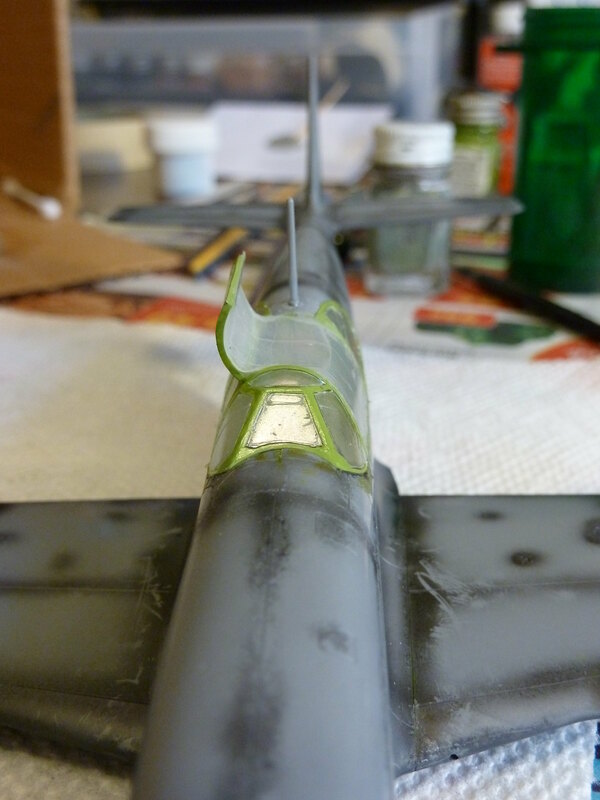 All canopy parts glued into place (minus the port panel), then an unstretched piece of Parafilm was cut to size and carefully white-glued all around the canopy. I'm pretty sure it did its job keeping paint out...hopefully the glue won't be too hard to remove or cover over. The top and bottom colors are done and sealed with Future. Now for some suggestions regarding invasion stripes. Here's my diagram. So my plan is to apply masks for the Q's and C/S, spray the whole section black, mask off the black stripes and spray white (should give the white stripes a more distressed/rushed look), then remove all masks and put on all the decals. I don't know why I'm particularly nervous about this part, but I guess I'm just looking for support to make sure I don't ruin my model so close to the end (like I've done before). So...that plan make sense or should I change everything? Hmmm, we gotta fix your pics, Robby! I'm not seeing your images neither, Robby. They are either too large or the privacy setting is wrong, I guess. Hmm, I was seeing them, but they've now gone. Odd. Ah nuts...they're displaying fine to me, but I guess that's not saying much. I gave up on Photobucket since everyone's links seem to be dead now. I'm just using Google Photos now and I lowered the privacy settings for these pics, but apparently that's not enough. What's the hip new site for picture hosting nowadays? I'll try to play around a bit more in the mean time. Removed by original poster on 11/26/17 - 14:35:16 (GMT). Been away for a few years; this looks like the perfect campaign to re-start modeling.